(CNN) -- With Sen. Hillary Clinton's presidential campaign officially over, she is focusing on making sure her supporters back Sen. Barack Obama's bid. 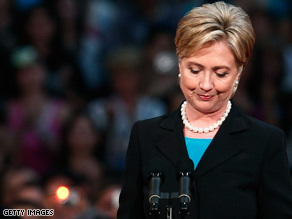 Sen. Hillary Clinton suspended her presidential campaign on Saturday. Throughout the primary season, Clinton and Obama expressed confidence the Democrats would unify once a nominee emerged. As Clinton closed her campaign Saturday, she urged the cheering crowd of thousands to support Obama in his run for the White House, saying she and supporters should "take our energy, our passion and our strength and do all we can to help elect Barack Obama ... I ask all of you to join me in working as hard for Barack Obama as you have for me." Clinton has vowed to do whatever she could "to ensure that Democrats take the White House back and defeat John McCain." Concern about the division in the party arose because Clinton and Obama appealed to such different segments of the electorate. Clinton did well with working-class voters and the elderly. Obama rallied the support of affluent, well-educated voters, African-Americans and the younger generation. Some of Clinton's top supporters say the best way to get the New York senator's 18 million voters behind Obama is by putting Clinton on the ticket. Democrats appear to like an Obama-Clinton ticket. A CNN poll released Friday suggested that nearly half of those voting Democrats, 54 percent, would support a joint ticket, but 43 percent would oppose it. The poll's margin of error was plus or minus 4.5 percentage points. "I've looked at every other possible candidate. No one brings to a ticket what Hillary brings," Sen. Dianne Feinstein said Sunday on ABC's "This Week." But not everyone is behind the idea of a joint ticket. Former President Jimmy Carter said that would be "the worst mistake that could be made." "That would just accumulate the negative aspects of both candidates," Carter told The Guardian, a London newspaper, saying that both candidates' vulnerabilities could overshadow the ticket if the two team up. iReport.com: Share your thoughts on a "joint ticket"
Feinstein said she thinks Obama needs to reach out to the Clinton supporters "using Sen. Clinton's help." "He needs to reassure them as to what he would do in the agenda for change, because the comparisons with McCain are very stark. Certainly with respect to the economy, extending unemployment insurance, building infrastructure," she said. Obama and Clinton met in Feinstein's Washington home on Thursday. They spoke alone for about an hour, in a move seen as the first step in healing the rifts in the party. Feinstein said she chatted with Clinton before Obama arrived. "She expressed to me the depth of her concern and caring, the fact that she had 18 million who put their hopes and dreams in her ability to create new opportunities for people. She wants to continue that. She recognizes that it's over, and I think every instinct in Hillary Clinton is to help," she said. The main page on Obama's Web site has been updated with a message that says, "Thank you Senator Clinton," and links to a form where visitors can send a message to her. Clinton's Web site now urges visitors to "support Senator Obama today." CNN analyst Gloria Borger said Clinton must speak to the female voters who supported her, "many of whom are so angry about this race." "She really has to tell women why Barack Obama is the best candidate for president," Borger said. "She has to go a long way to try [to] get rid of that anger." CNN senior political producer Sasha Johnson said Clinton's speech was a "first step" in making inroads to persuade her supporters to back Obama, but she said it's too early to tell what the effect will be. "I would argue that most of the people in that room want a Democratic president and will come around, and those that still aren't sure yet will probably come around, but again, I think some won't. This was a hard primary for Democrats," she said.